Bugey is a small region within the Ain département about midway between Lyon and the Swiss border. Bourg-en-Bresse, the capital of Ain that's famous for it chicken (the delicious steel-blue footed chicken that has its own AOC), is about forty minutes away by car. Bugey is not well known, even in France. It is often lumped in as being part of two other isolated regions, the Savoie (which it is not) or Burgundy (of which it is also not). 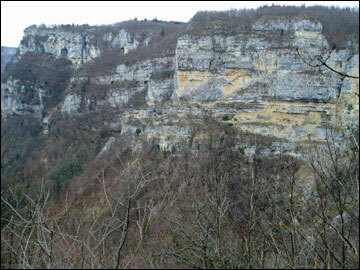 The Bugey vineyards occupy two areas on the lower slopes of the Jura mountains. Bugey is a VDQS (Vin Delimitée Qualité Supérieur) and not an AOC, and consequently overlooked by serious wine drinkers. After all, the laws in VDQS zones are not stringent as those in AOCs — which always get more respect. The region is a natural geographical crossroads. 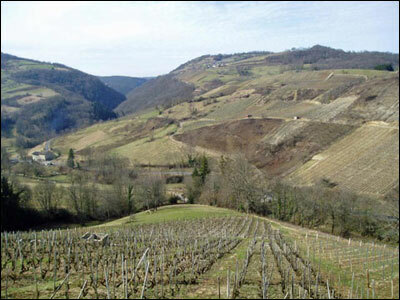 The grape varieties planted here reflect this, juxtaposing the grapes of Jura, Savoie and Burgundy. Bugey uses a large variety of grapes to make a wide variety of wines, including sparkling wines and still wines. Jean-Anthelme Brillat-Savarin was born in 1755 in Belley, a commune in the southern part of the Bugey region not far from Maison Angelot. Among the first to write seriously about eating and the art of the table, he became famous for his amusing remarks about dining like, "Tell me what you eat and I will tell you who you are." Or, "Dinner without cheese is like a beautiful woman with only one eye." Brillat-Savarin once wrote, "The discovery of a new dish confers more happiness on humanity than the discovery of a new star." And, if that's not enough,"Those persons who suffer from indigestion, or who become drunk, are utterly ignorant of the true principles or eating and drinking." 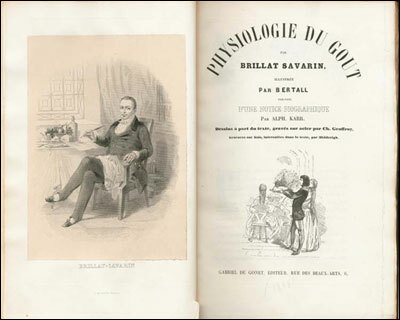 Monsieur Brillat-Savarin and his most famous workHis landmark book, Physiologie du Gout, was published a couple of months before his death in 1826. In it he discusses in great detail the pleasures of the table, never forgetting that the simplest meal, as long as it was made with artistry, should be entirely satisfying. "I was in the drawing room, enjoying my dinner," said Brillat-Savarin one night. "Eating dinner in a drawing room?" interrupted his friend. The great gastronome paused momentarily and regarded his friend with equal curiosity. "I must beg you to observe that I did not say I was eating my dinner," he smiled, "but enjoying it. I dined an hour ago." In recognition of his accomplishments, a cheese, an omelet, a salmon dish, a garnish and a consommé all bear his name.